A college degree may guarantee more income over a lifetime on average, but it says nothing about what you are likely to earn. Here’s something to rattle already anxious parents: Your child isn’t all that likely to finish college in four years—or perhaps ever. Recently I tapped my information into an online graduation rate calculator managed by UCLA and discovered that only about four in 10 Kates—white females who scored fine on standardized tests and earned good high-school grades—will graduate on time. A little more than six in 10 cross the stage within six years. And the rest of us? The website doesn’t divulge. 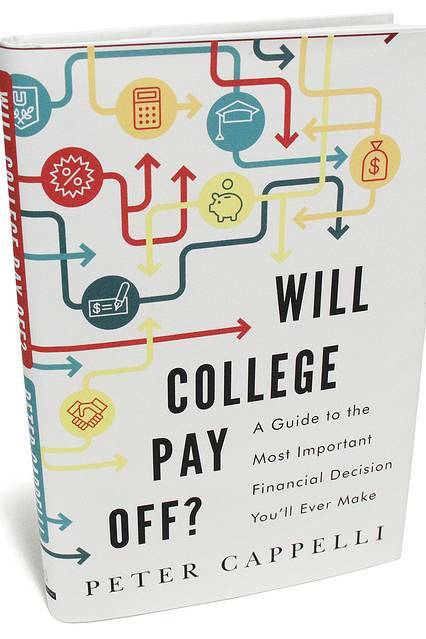 Directions to this tool come a few pages into Peter Cappelli’s “Will College Pay Off? A Guide to the Most Important Financial Decision You’ll Ever Make.” College tuition has outpaced inflation for three decades, and employment prospects for graduates are grim: More than 40% end up with a job that didn’t require a college degree, according to Federal Reserve data. So it’s precisely the right moment for a book to help 18-year-olds and their parents make this important educational and financial decision. Mr. Cappelli dissects the oft-repeated rhetoric that a college degree guarantees you more income over a lifetime. Sure, this is true on average, but it says nothing about what you are likely to earn. Alumni of elite schools probably would have done well in life without the Ivy League christening. Plus, the data often track people who graduated decades ago, telling today’s students nothing about what they can expect to earn. The reason that college graduates are still earning more is in part a function of college graduates swiping jobs typically reserved for high-school graduates, who are then displaced. About 60% of parking-lot attendants have some college education. Mr. Cappelli recounts the 1990s, when all and sundry predicted a shortage in information-technology workers that never materialized, and he rightly points out that pundits and policy makers have an atrocious record of predicting the labor market 10 years in advance. “In short, the jobs that get the attention in any year for being the place to be get that way precisely because we didn’t know, probably couldn’t know, that they would be the place to be.” To be safe, it might make sense to study something that will “provide lessons that extend beyond any individual job,” such as the liberal arts. Yet one reason that students have flocked to technical majors is a palpable decline in academic rigor in traditional disciplines—the sense that the faculty teaching the liberal arts with the Socratic method are the same illiberals that handed the poor guy the hemlock. Mr. Cappelli cites a study that found that about a third of college students at four-year public universities saw no intellectual growth in basic areas like critical thinking and writing. No wonder students think that calculus is a better bet. Colleges escape basically unscathed from Mr. Cappelli’s account. “Critics of higher education,” he writes, “say that financial aid and especially increases in financial aid over time have really just been a means for allowing colleges to raise their prices. . . . That argument assumes that colleges are like businesses operating with the goal of making money. If they were, though, the elite colleges could double their tuition and still fill up the classes.” This is an absurd response to a simple contention: When colleges have more money, they spend more money. For instance, the number of administrative employees has grown 50% faster than the number of instructors, according to the Education Department, a topic left untouched in this book. Still, Mr. Cappelli offers some good tips: Student loans are stickier than a mortgage: You can’t escape them with bankruptcy, and you may find your wages garnished if you try to walk away from them, never mind your bad credit rating. Don’t rely on data released by colleges, particularly employment rates, which are often calculated based on dubious self-reporting surveys. When you visit a school, check out the tutoring center and see if anyone is around to help; it’s a good proxy for the campus support system. Most important, finish on time. A surefire way to erode your return on college is to graduate late or not at all. Ms. Bachelder is an assistant editorial features editor at the Journal.